Stuffed Cabbage Rolls made with simple and inexpensive ingredients, but they have so much flavor! Serve with sour cream. P.S. They are freezer friendly! Fill 2/3 of large soup pot with water and bring to boil. Add 1/2 Tbsp salt and 4 Tbsp vinegar. Peal and discard outer two leaves from each cabbage. Use a knife to cut out the cabbage cores. Place first cabbage in water, cork side down, for 5 minutes, then flip cabbage over and continue cooking 5-6 min. Pull off leaves as they begin to soften. Leaves cook faster if pulled apart. Remove the leaves to a platter to cool when they are done. Leaves are done when soft and yellowish and larger leaves will turn a dull green. Repeat with the second cabbage, adding more water if needed. Reserve 3-4 cups water from the pot. In a large bowl, combine meats and rice. Grate 4 carrots and saute in a large pan in 3 Tbsp oil and 1 Tbsp butter over med/high heat until softened then add 1 cup marinara sauce and saute another minute. Add mixture to rice and meats then add 2 eggs and 1 Tbsp salt and mix well. Large leaves: cut the leaves in half down the center along the stem and remove tough stem portion. Place 2 Tbsp meat mixture at top of each leaf (or what you can fit since leaf sizes vary). Roll the leaf into a cone shape with the thicker part of the leaf at the base and stuff the wide thiner leaves into the top. Arrange stuffed cabbage in a dutch oven or pot. Small Leaves: slice off the raised surface of the tough center stem to flatten leaves for easier rolling. Fill each cabbage leaf with about 2 Tbsp meat mixture. Place the filling over the stem/ bottom portion. Roll like a burrito and stuff both ends in. Heat approx. 2 Tbsp olive oil in a skillet. Saute remanding 2 grated carrots with 1 tsp of Mrs. Dash, cooking until soft. Add 1 Tbsp sour cream and 1 cup marinara sauce. Saute another minute and remove from heat. 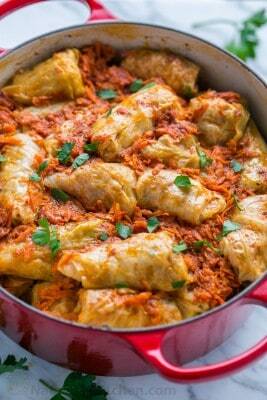 Pour Podliva sauce over stuffed cabbage and add enough reserved water to almost cover rolls (2 1/2 to 3 cups). A: If using the pot, bring to light boil, then cover and simmer 40 min over medium heat. B: If using a dutch oven (recommended method), cover and bake at 450 ° F for 20-25 min in the bottom third of the oven then reduce heat to 350°F and bake 1 hour. To Freeze: Once cabbage rolls are at room temperature, divide them into freezer safe ziploc bags in single layers, adding a little sauce to each bag. Push out any excess air from ziploc bags then seal and freeze. To re-heat: Thaw completely in ziploc bags in the refrigerator. Add 1 Tbsp oil to a non-stick skillet, then add thawed cabbage rolls, cover and cook over medium heat, turning a few times until heated through.